Silent Crime: Addressing a difficult issue through Drama. Posted on February 5, 2015 at 4:45 am. Editor’s Note: Last Year the GeriActors and Friends performed “Our Lear” in conjunction with a project one of our Friends directed with the Jewish Family Services about Elder Abuse. Here is a post by the director Barry Bilinsky about his experience. As a volunteer with the GeriActors and Friends since 2012, I have etched an interesting role for myself in the group. As neither a student nor a senior, I find I often search for openings to make offers and jump in, since few scenes early on were put into my care from the outset. When an opportunity arose with the title Socio-Drama Director – I jumped at the chance. Luckily for me, my experience with the GeriActors was crucial for working on the project. The Silent Crime was a project developed by Jewish Family Services as part of their “Pan-Canadian Elder Abuse Awareness and Education for Ethno-Cultural Communities” Campaign. This project spanned three years and involved five cities across Canada. Each Jewish Family Service office in the five separate cities put on shows that were adjusted to meet their individual community’s needs. 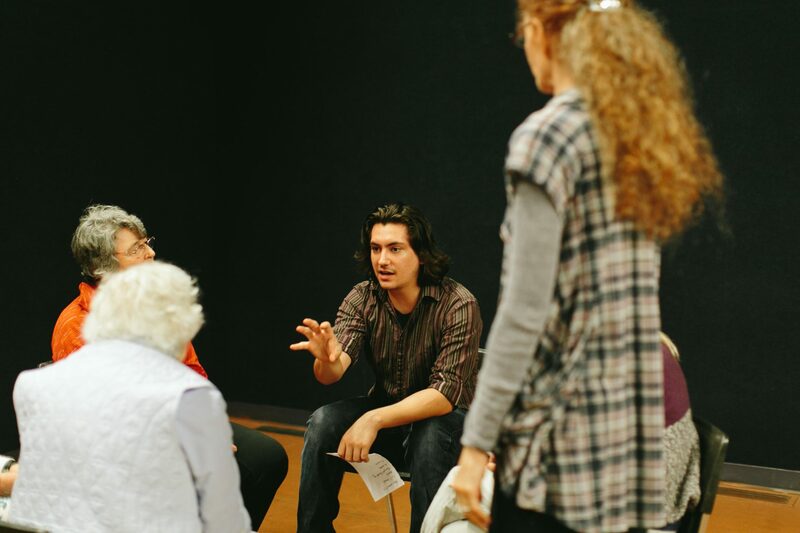 A primary goal of the plays – other than to be staged and raise awareness on the issue of elder abuse – were to have casts consisting of volunteers and seniors. The GeriActors, a group with more energy than many others I’ve come across, was full of performers interested in the project. With a task at hand and a bevy of eager beavers, I was ready to get to work. It took awhile to figure out how to approach the text and what would be the most beneficial approach to the text. Something I find integral to the work created through GeriActors and Friends’ play development is the need for characters that stem from our own reality. This requires connecting to the topic at hand and finding points of contact between our lives and the world in the play. After openly discussing the issue at our first rehearsal, we soon discovered that everyone had a notion of what elder abuse was, but some had to stretch to connect. Eventually, I would find this circumstance to be the most compelling and driving element of the play. Due to time constraints and the chaos of the summer, we staged two readings of the piece at The Jewish Drop-In Centre and Temple Beth Ora. Both events raised very important questions about the text and helped me focus the next leg of the project. After the play readings, I continued to struggle with the script. I found certain elements, that were meant to create a stark image of elder abuse, actually removed the issue from a personal experience to one that happened to “other people”. The more I honed in on these issues, the more the piece flowed. I began by breaking down the perpetrator/victim situation in the script – one we often see in depictions of domestic abuse – and started looking at the family structure. What are some circumstances where someone would be driven to be cruel to a loved one in their later years? How can someone justify this behaviour? What are different levels of abusive behaviour? I listened carefully to input from my cast, and discovered the players could believe their actions more. That is when the issue started to make sense! Each act of abusive behaviour stemmed from a need, something they had trouble getting through other means. I was happy to see the piece begin to pose a clear set of questions regarding why someone would commit elder abuse and how it might be prevented or intervened. Although I was glad to find a way to spur on conversation with the piece, I was aware of some problems to piece might now face. The one at the forefront of my mind was – If we can find ways for the characters to justify their actions, are we justifying this kind of behaviour. Furthermore, are we at risk of blaming the victim of this situation for the abuse put on them. As with much of the work that gets the GeriActors treatment, the answers are rarely solved and never easy. Looking back on the project, I am more inspired by the intergenerational creation process. Had I approached this scene without the diverse conversations and conflicting opinions that arose from very different perspectives on the piece, I would have been able to draw stronger conclusions on a topic that requires the opposite. I was also able to toggle through the different perspectives in real time, ask opposing questions and get contradictory statements on the issue which made the piece richer and far more interesting. But, most importantly, by combining the GeriActors and the Silent Crime, I had a committed group of fun individuals who were interested in seeing the piece grow.